"Make ready to land our troops beyond the energy shield and deploy the fleet so that nothing gets off the system." In the midst of the Galactic Civil War, every battle is a struggle for the Rebel Alliance and the Galactic Empire. When you’re commanding your troops in Star Wars™: Legion, you need the necessary tools to defeat your opposition. In order to achieve victory, you’ll have prepare your troops, develop new tactics, and scout the battlefield. Now, you'll have the chance to situate your battles among the sandy wastes of one of your favorite Star Wars planets. Fantasy Flight Games is proud to announce that two new gamemats for Star Wars: Legion are now available for pre-order from your local retailer or our website. Upgrade your Star Wars: Legion collection with the Desert Ruins Gamemat and the Desert Junkyard Gamemat! 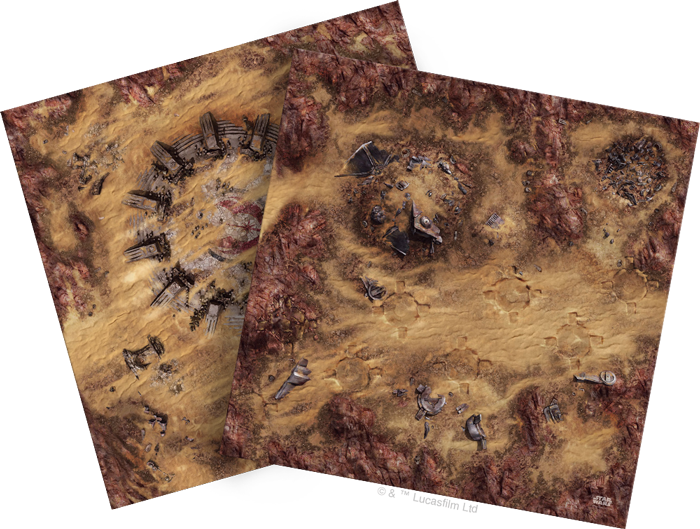 The Desert Ruins Gamemat and Desert Junkyard Gamemat are 3' x 3' slip resistant mats that make the perfect battlefield for the epic infantry engagements of Star Wars: Legion. Furthermore, both mats are designed to be seamlessly combined to create a 3' x 6' space, perfect for a full game of epic battle. 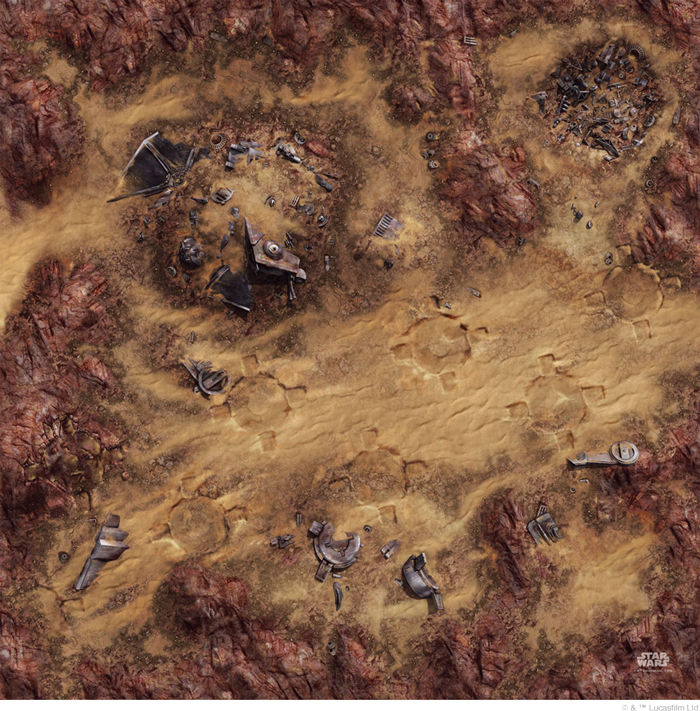 The Desert Junkyard Gamemat transforms your infantry battles into grungy skirmishes. Command your troops in the maze of a wasteland and overwhelm your foes with superior tactics while the battle unfolds on this beautiful slip-resistant mat. Across from the junkyard sit ancient ruins. This once-great relic of times long past now becomes a battleground between the Rebel Alliance and the Galactic Empire. 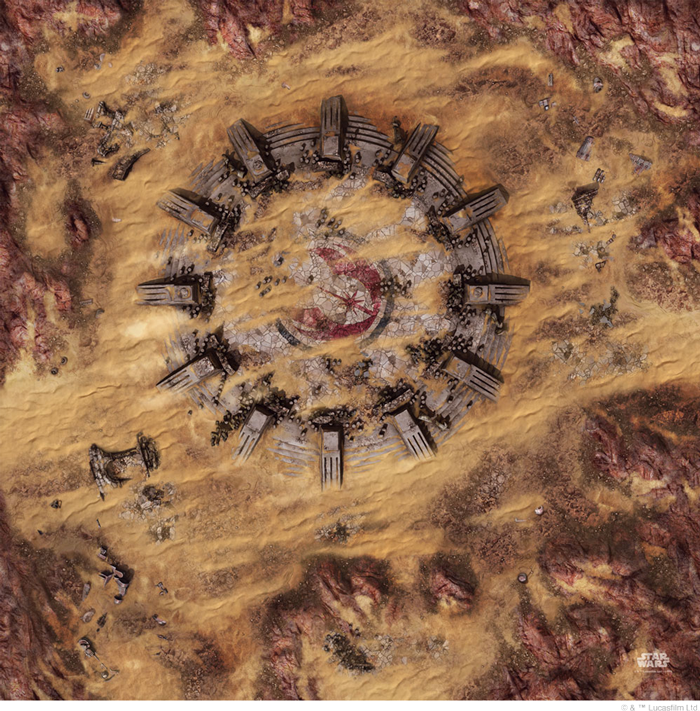 Maneuver your troops into position and claim victory with the Desert Ruins Gamemat. The Galactic Civil War encapsulates almost every part of the galaxy, from the vast city of Coruscant to the deserts of Tatooine. Give your troops the immersive, thematic setting they need with the Desert Ruins Gamemat and the Desert Junkyard Gamemat! Land your troops with the Desert Junkyard Gamemat (SWS46) and the Desert Ruins Gamemat (SWS47), available now for pre-order from your local retailer or our website!